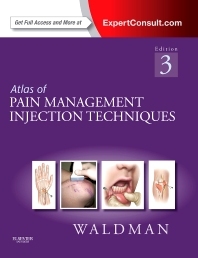 Master every essential pain management injection technique used today with Atlas of Pain Management Injection Techniques, 3rd Edition. With expert tips from leading authority Steven D. Waldman, MD, JD and abundant step-by-step color illustrations, you’ll see how to evaluate the causes of pain, identify the most promising injection approach, locate the injection site with precision, and deliver the relief your patients crave. From the head and neck to the foot and ankle - and everywhere between - this best-selling pain management reference equips you to perform a complete range of clinical injection techniques with greater confidence! Perform each technique like an expert and avoid complications with clinical pearls in each chapter. Access the complete contents online at www.expertconsult.com. "Most of us who practice interventional pain management will own a copy of one of the many and usually very excellent procedural 'bibles'. Whether to brush up on a seldom performed procedure, to learn something new, or simply to reassure yourself that you are performming a particular intervention correctly, these books are invaluable... You only need to look at the contents page though, to realize that this book is filling a niche...The book is clearly laid out and divided into eight anatomic sections. Each procedure is described in terms of the indications and clinical considerations, clinically relevant anatomy, technique and side-effects abnd complications. Most procedures have an accompanying 'clinical pearl'...Well written, well laid out, and beautifully illustrated."